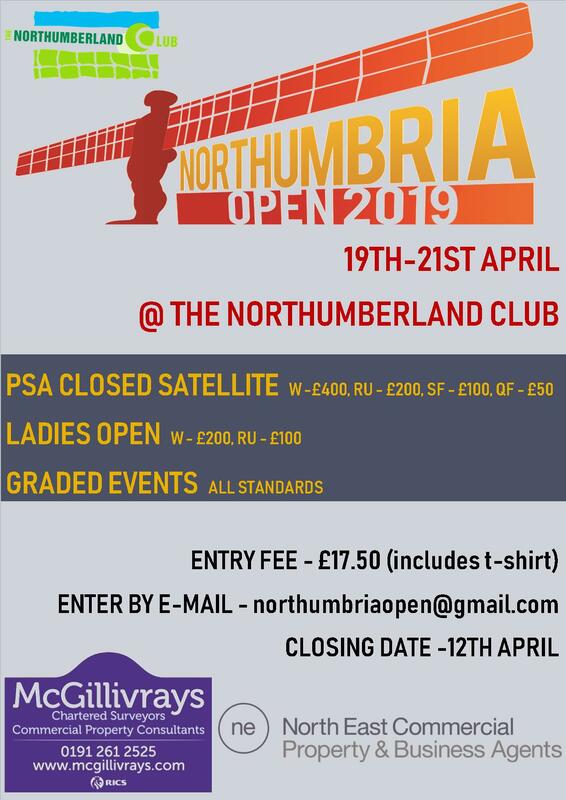 NORTH EAST starlets Laura Neill and Michael Mattimore kept the Geordie flag flying at a jam-packed Northumbria Junior Open. Both junior county players, with a long history of tournament success, proved the cream of the Under 17 crop at the Northumberland Club. More than 100 junior squash players from across the North of England – and Scotland – turned up the temperature on court after descending on Newcastle to fight it out over 168 hotly-contested matches. Sponsored by Black Knight, who provided rackets and bags as prizes, the competition was ‘full monrad’ for all competitors, meaning every player fought it out for a final place and all were involved right to the end. Neill was pick of the crop in the Girls Under 17 event, beating Tynemouth’s Daisy Dobson 3-0 in the final – but only after a tight finish (12-10) in the first. Hot on their heels were Tynemouth twins Amy and Emma Rowell – Amy edging it over her sibling this time to grab third place. Northern’s Mattimore beat Michael Andrews of Northumberland Club in a superb Boys U17 final. This one went right to the wire before the former clinched a 3-2 win, 11-9 in the fifth. Durham’s David Collins and Jesmond’s Ben Waugh made up the top four in a 13-player field. Barker lost the first game in her Under 19 final against fast-improving Cumbrian Eve Driver. However, the Barker hit back strongly and took the next three games to take the title, albeit after a marathon effort from Driver in the fourth game, before going down 16-14. Jesmond’s Charlotte Cooper finished fourth behind Charlotte Cooper of Yorkshire in a very strong field. 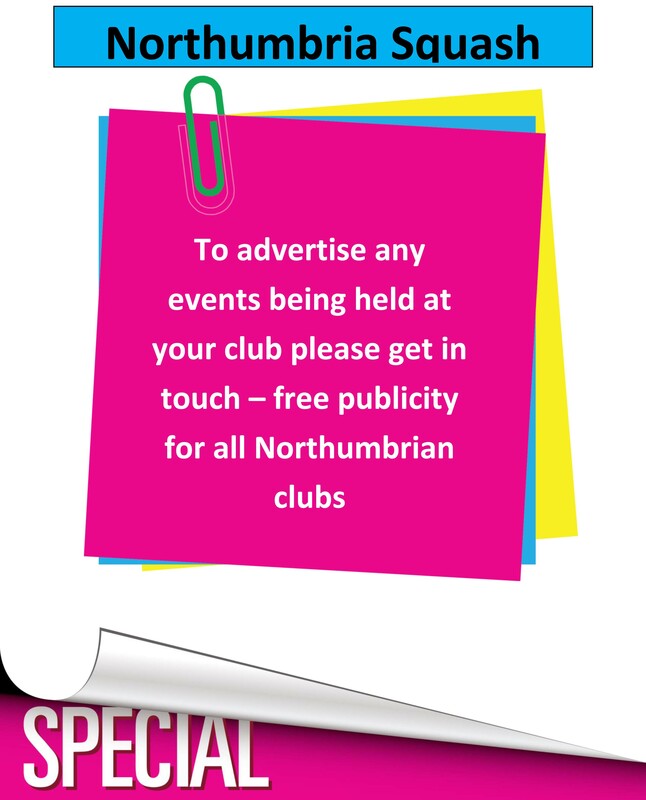 Other Northumbria players to lift a trophy were runners-up Jamie Todd and Tom Walsh (both Tynemouth), and Northern duo Zoe Shipsey and Luca Baldasera. At Boys Under 19s, Scottish junior No 1 Richie Hollins was the deserved victor, after overcoming two of the region’s best juniors on his way to the title. He saw off Cai Younger 3-1 in four close semi-final games, and then came back from matchball down against Tynemouth Tornado Jamie Todd in the final. Todd, who had booked his final place with a 3-0 win over Durham’s Michael Graham, was oh-so close to doing the same against Hollins at 2-0 and 10-8 up. But Hollins, adding real speed and determination to his renowned shot-making skills, fought back gamely to win 3-2. Yorkshire’s Poppie Jaram – coached by Malcolm Willstrop at Pontefract – headed up a 14-strong entry at Girls Under 15s, ahead of Durham’s Lydia Robinson, winning the final 3-0. Local starlets Erin Vitty, Lowri Waugh, Megan Evans and Aanya Hamilton all finished in the top half of the draw to show the county’s impressive strength in depth at junior level. It was a similar story for the boys, with Northumbria providing the runner-up (Andrew Shipley), third place (Liam Duncan Kahn), 6th, 7th and 8th (Harry Little, Lennox Lockwood and James Appleby respectively). Cumbria’s fast-improving Adam Goad was marginally too strong for the energetic Shipley in a super final, emerging triumphant at 3-1 after clinching the fourth game 13-11. At Girls Under 13s, Saran Nghiem was in imperious form, winning three matches without dropping a game – and dropping only losing 27 points out of nine games in the process! Rebecca Smith (Carlise), Beth Dean and Annie Anderson make up the top four. The boys Under 13s final started off at a furious pace between Northumbria duo Sam Aiston and Tom Walsh. Aiston took the first 11-9, Tynemouth’s Walsh hit back with the same scoreline in the second, but his opponent, from the Northumberland Club, ran out a deserved 3-1 winner in the end, taking the last two games for the loss of only four points. Northern’s Milan Stach took third spot after beating John Thompson in his play-off. At Girls Under 11s, seven girls fought it out – Durham’s Jessica Weatherspoon winning 3-0 against Northern’s Zoe Shipsey. Amelia Sherlock and Talia Tiryaki finished third and fourth respectively. Local favourite Ollie Forster stormed to victory in a strong Boys U11 tournament, beating Luca Baldasera 3-0 in the final (11/4, 11/4, 11/5). William Marrow kept his nerve to clinch third spot with a 3-2 win over Sam Ogilvie, clinching the match 11/7 in the decider.